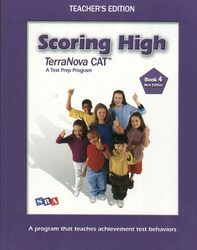 Help your students prepare for the newest version of this test with the most recent edition of Scoring High on the TerraNova CAT. Student editions contain expanded practice opportunities with more than 80 added pages to help students with all areas of the test, including reading, language arts, mathematics, and listening skills. Each student book also presents a model of the TerraNova that the students will be taking, helping them to become comfortable with the format of the test. The teacher's edition contains updated questions, format, and content areas to help prepare students.